I made an exciting discovery late one Sunday evening recently when I discovered BBC Radio 4’s Word of Mouth; I don’t know how it slipped under my radar for so long. My introduction to the Michael Rosen-hosted show was the recent episode entitled Office Jargon. The programme, promoted as ‘where Michael Rosen and guests “drill down” into the subject of office jargon’ proved to be an absorbing radio gem. So much so, in fact, that I searched out the programme pages on the Radio 4 site and discovered a wealth of back episodes just waiting to be listened to. Over the last few years (there are currently 57 back-episodes on the BBC website), the programme has covered a fascinating selection of language-related topics ranging from the aforementioned office jargon to ‘miscommunication, mondegreens and misophonia’ and our linguistic ties with German. Check it out. Excellent stuff. This Cheltenham copywriter will definitely be delving into the programme’s treasure chest of archive material whenever he gets a chance. And I’d recommend that you do too. Now back to a load of website copywriting: it’s garden design and landscaping, specialist roof coatings and commercial laundry today and I love every minute of it. By the way, do you have a favourite language-related radio programme. It could be in the UK or elsewhere in the world. If so, I’d love to know all about it, so feel free to leave a comment and share. This entry was posted in Copywriting Resources, Uncategorized and tagged bbc radio 4, copywriters cheltenham, copywriters gloucestershire, gloucestershire copywriter, michael rosen, office jargon, word of mouth on January 27, 2014 by alwrites. Readers may recall my earlier announcement that the WinBiz Networking Group is holding its second quarterly evening event at Nailsworth’s Egypt Mill from 18.00 on Wednesday 22 January 2014. Our original guest speaker was chauffeur-butler David Keffler, but unforeseen personal circumstances now mean that his appearance has been postponed. I’m delighted to say that Martin Clarke OBE, the ‘concrete superhero’ chief executive of the British Precast Concrete Federation (BPCF), has kindly agreed to do the honours instead. 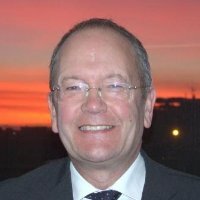 Martin, who was awarded his OBE in 2013 for services to the concrete industry, was our group marketing manager when I worked at ARC Group Marketing in the 1980s. As such, he is one of the mentors who has shaped the Al Hidden Gloucestershire Copywriter that you all know. At Win-Biz, we’ve had our eyes on Martin, who is based locally in Wotton-under-Edge, as a guest speaker for some time. Now it seems that fate has brought forward his involvement and we’re all very grateful that he has agreed to help out. I’m doubly thrilled because I shall be fulfilling an ambition to do a celebrity interview as I look back at a career in concrete with Martin and tease out some enlightening lessons for local SMEs. Martin is a fascinating speaker with an encyclopaedic knowledge from a stratospheric career in the anything-but-boring world of concrete. To reserve your place at next week’s event (with payment of £15.00 for visitors on the night), please book on the Win-Biz Networking website. I, and the rest of the Win-Biz team, look forward to welcoming you to an evening of networking with like-minded business folk, a delicious buffet supper and Martin’s talk as the evening’s centrepiece. It’ll be a great night. This entry was posted in Uncategorized and tagged bpcf, british precast concrete federation, concrete, egypt mill, martin clarke obe, nailsworth, networking, win-biz, winbiz, wotton under edge on January 15, 2014 by alwrites.